Leave Reykjavik for a day, a weekend or a whole week to drive around and see the natural beauty of the island. There are waterfalls, volcanoes, lagoons, glaciers, fjords, wildlife and lava fields. This is where your outdoor adventure begins! 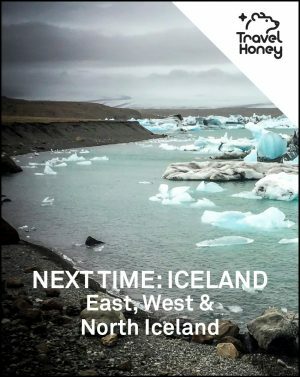 Check out the Travel Honey ICELAND PHOTO GALLERY. View the ICELAND COUNTRY OVERVIEW for everything else. South to South East. To the South, the Ring Road runs close to shore, and the journey is dominated by glaciers and waterfalls. Inland from the South Coast, the Laugavegur trail offers spectacular hiking. It’s the next most popular region after Reykjavik and the Golden Circle. East to North East. East of the Glacier Lagoon, you’ll find quiet harbor towns starting with Hofn, dotting the East Fjords. Visitors head east to see puffins and wild reindeer herds. The farther northeast you go, the less touristy it gets. North. As you head west from the East Fjords, the Ring Road is more inland and dotted with lakes, becoming more volcanic. Most popular is Lake Myvatn which includes the Myvatn Nature Bath, a cheaper alternative to the Blue Lagoon. North Iceland is popular for whale watching. West. The remote and dramatic cliffs of the West Fjords dominate northwest Iceland. Driving south down the west coast is the most popular destination in the west, Mount Kirkjufell in the Snaefellsjokull Peninsula. It’s another 2.5 hours south through low farmlands to Reykjavik. WHERE TO STAY IN THE REST OF ICELAND? Iceland’s lodging stock is trying to keep up with the influx of visitors, so book early for the biggest selection, especially in the summer. Also expect prices to almost double in the summer. We’ve listed our favorite hotels below but Airbnb’s are also a good option. Icelandair Hotel Vik ($$$$) Just off the Ring Road and across from the beach. The living is easy at this modern hotel with nice views. Hotel Selid ($$) Comfortable accommodations in a serene location a bit north of the Ring Road, east of Hella. It’s one of the better quality affordable options so it books up quickly. Milk Factory ($$$) Cavernous and loft-like, with a muted gray color palette, this hotel is understated cool. Free bikes and minimalist perfection. Vid Lonid Guesthouse ($$$) On a fjord lake and surrounded by mountains, there are plenty of Scandinavian vibes at this place. High ceilings and hardwood floors. Lake Hotel Egilsstadir ($$$) Stay in a stylishly renovated farmhouse on a gorgeous lake and eat gourmet meals. Just off the Ring Road. Deplar Farm ($$$$$) Ultimate luxury in a remote peninsula of northern Iceland. With two helicopter pads onsite, this is where you go to get away from it all. Klaengsholl Lodge ($$$) Super cozy lodge with hot tube and sauna. Midsitja ($$) Tidy log cabin in the middle of a green, grassy field. Unbelievable value. Hotel Egilsen ($$$) Eclectic and colorful rooms in a historic building. Great views of the ocean and easy access to ferries and the West Fjords. Hotel Rjukandi ($$$) No nonsense place to sleep, traditional Icelandic lodgings serving organic, local dishes. Oxl ($$) Country house with a BBQ and views of the ocean. Amazing price for the location. WHERE TO EAT IN THE REST OF ICELAND? Glacier Goodies ($$$) A food truck at Skaftafell National with warm lobster soup, BBQ ribs and fish & chips. Pakkhus ($$$) A popular restaurant with a stylish interior and tasty dishes. It’s known especially for its lobster. Klausturkaffi ($$) Legendary lunch buffet followed by cake buffet in the afternoon. Guesthouse Egilsstadir ($$) Best spot for burgers and curly fries that won’t break the bank. Vogafjos ($$) Located inside a cow shed and overlooking a lake, don’t miss the geyser rye bread. Cows are milked twice a day and patrons are welcome to join. Moo! Daddis Pizza ($) Best pizzas on this part of the island, open late and a big choice of toppings. Sjavarpakkhusid ($$) Eat mussels and sit on the patio overlooking the water. Finsens Fish & Chips ($) Gourmet fish & chips van in the marina. The views! The prices! GO. WHERE TO GO AT NIGHT IN THE REST OF ICELAND? Nightlife outside of Reykjavik? Good luck with that one. Your best bet is to purchase wine, beer and spirits at the local grocery store and find friends at the hotel. Hotel Ranga ($$) Cozy up to the bar and grab a seat in one of the cheeky stools. Stay for multiple, tasty drinks. Husio ($$) Respectable bar in the northern part of the island. Fabulous selection of beer. Vinbudin ($) Visit any location of this state liquor store on the island. Stock up on beers for $4 a can. Bottles of red wine start at $18. Nature Explorer Tour in Thorsmork, South Iceland; Hverfjall in North Iceland (photo from 6 day itinerary with John Henderson). BEST INSTAGRAM ACCOUNTS FOR THE REST OF ICELAND? HOW TO GET AROUND THE REST OF ICELAND? If you want to get out and explore the island, get a rental car. The farther you get from Reykjavik, the harder it is to find a taxi or tour for day trips. A plus for those of us from the U.S., Icelanders drive on the right side of the road and you’ll stay largely on the Ring Road, which does an entire loop around the island. But the Ring Road is only two lanes, so bad weather conditions and the occasional big truck can make a bit harrowing at times. When you venture off the Ring Road, you’ll often find poorer quality roads and those that require 4-wheel drive. So depending on when and where you’re going, consider renting a 4×4 vehicle. BEST ITINERARIES FOR THE REST OF ICELAND? Browse the latest tips from travelers and locals below. SEARCH HINT: Enter text (e.g. a destination) and/or choose a tag in the dropdown, then click SEARCH.